Eek! I truly didn’t intend to leave it four months before posting about my tree again! How on earth did that happen. And it isn’t even as if I haven’t visited it, taken photos even! Then life gets in the way of posting, and here we are, May. So, here’s a bit of a catch-up. 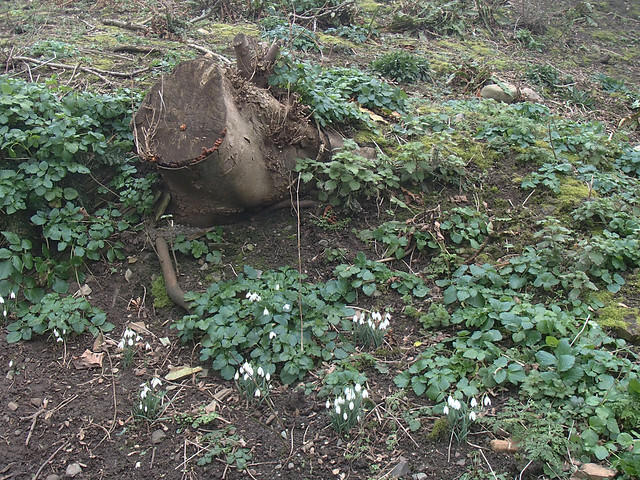 By mid March these were just memories and grass-like leaves, and daffodil leaves were making their presence known. 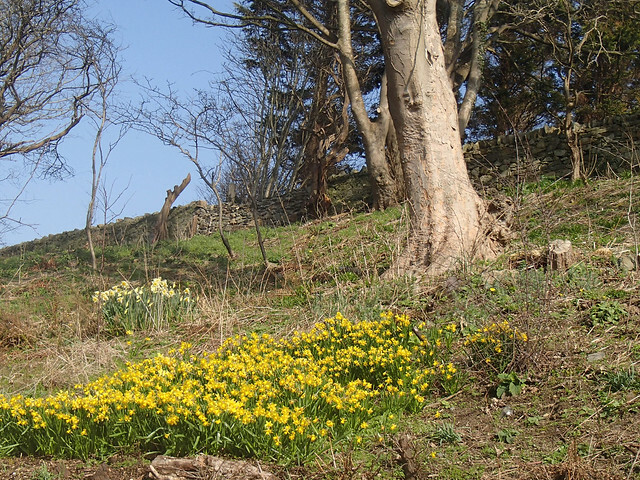 And in the more sheltered areas early narcissus were forming huge blocks of cheerful colour. 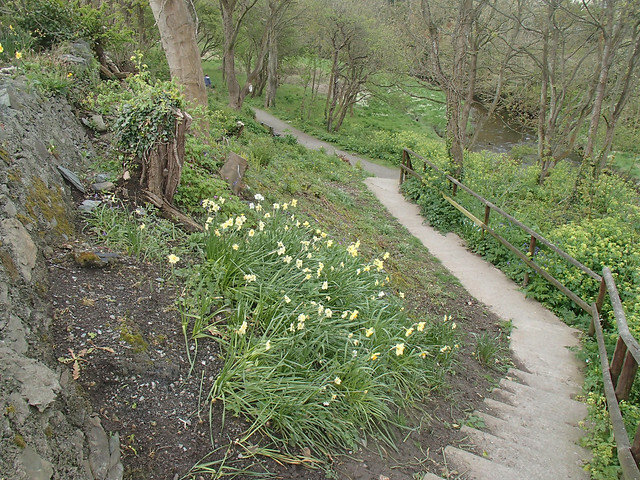 Now, in early May, the late narcissus are just going over, and there has been lots of clearance work on the bank, including, sadly, the removal of the stump with the fungi at the bottom there. 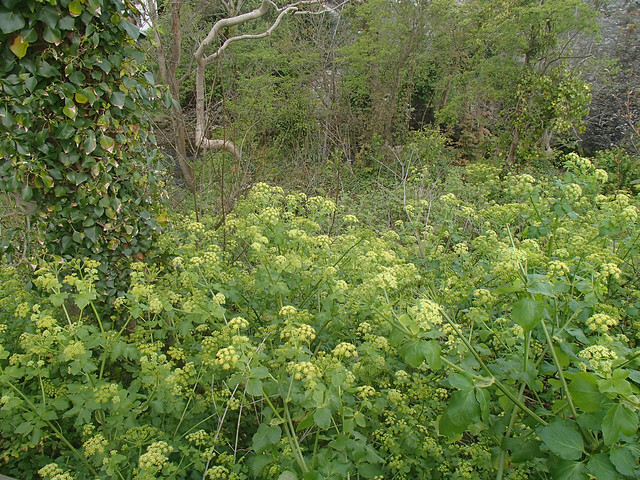 The clearance has included the Alexanders that were developing on that side, but on the other, wilder side of the steps, they still flourish. I love the freshness of the colours, the unfurling of the ferns, the shots of blue from the forget-me-nots and bluebells. 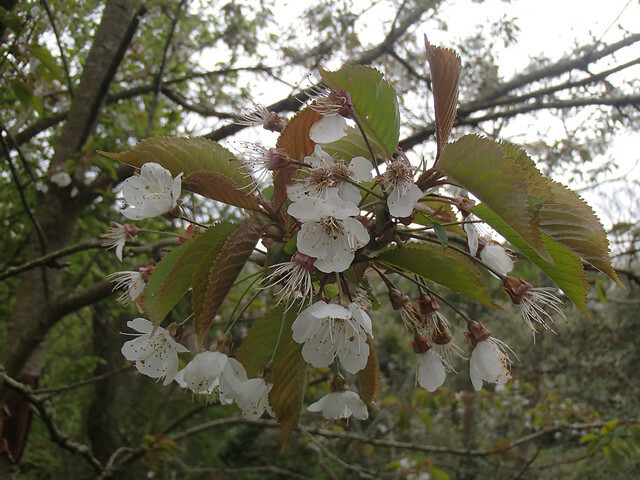 Many of the trees are still quite bare, but there is increasing colour, from blossom and young leaves. The bridge looks particularly inviting at the moment. One thing has become very clear – the right hand tree in the small cluster that is “mine” for the year is definitely a different species altogether. Even over winter this seemed probable, as the trunks looked different. The right hand one, with the birdbox on it, is relatively smooth, though clothed in lichens and moss. The little cluster to the left though, which is my focus, has a very gnarly appearance. Sycamore. Not my favourite sort of tree, thanks to the cluster we have around our house that are constantly trying to take over the whole area with their prolific seedlings. By contrast, my own tree cluster is still looking bare, at least on this side of the river, with just the fuzz of lichen breaking up the almost monochrome silhouette. There has been clearance around here too. This is what the base of the trees looked like in early February, and I was conscious that it was going to get progressively harder to get close to the trunks as the foliage filled out. 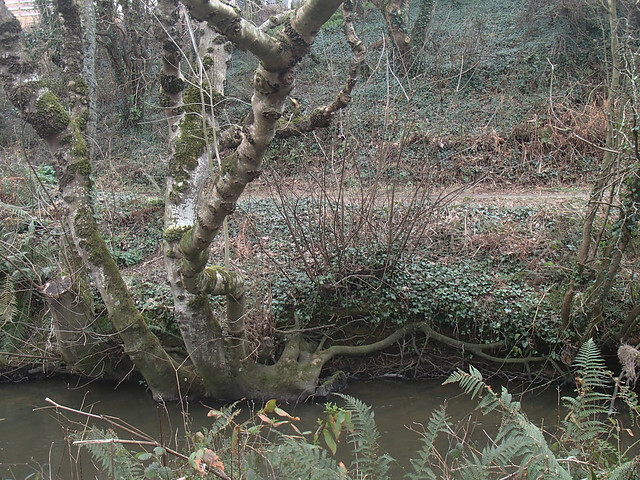 I can now actually get right down to the trunks themeselves, though no doubt the brambles will soon cut off access again. 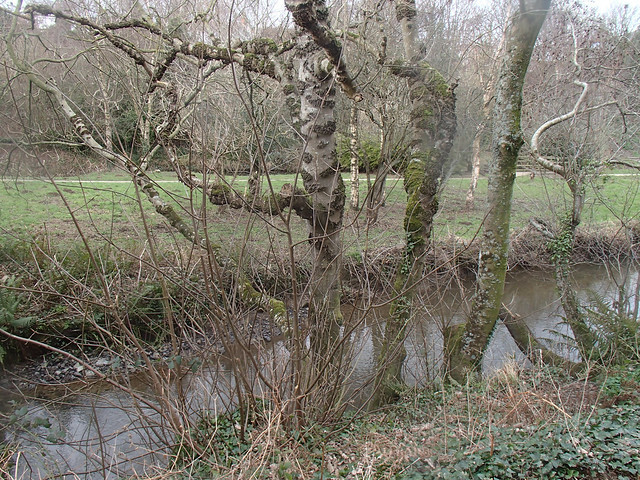 But I still don’t have definitive proof that my tree cluster is alder, so I wandered on up the valley to the next bridge to check it out from the other side. 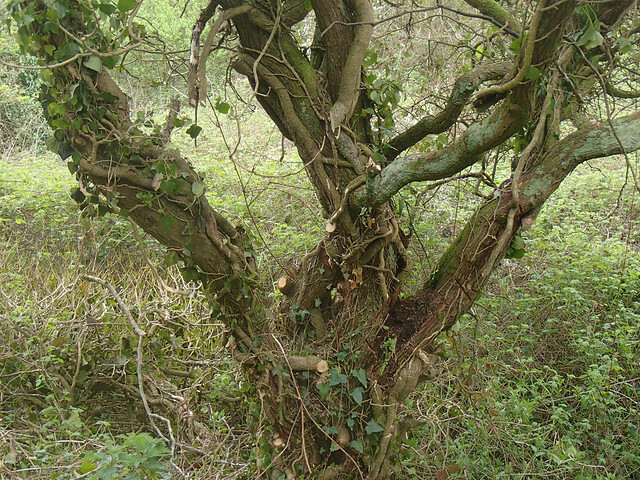 Whoever is in charge of the clearance programme is evidently in the camp that thinks ivy strangles healthy trees, since this hawthorn has had its ivy partner cut back severely. 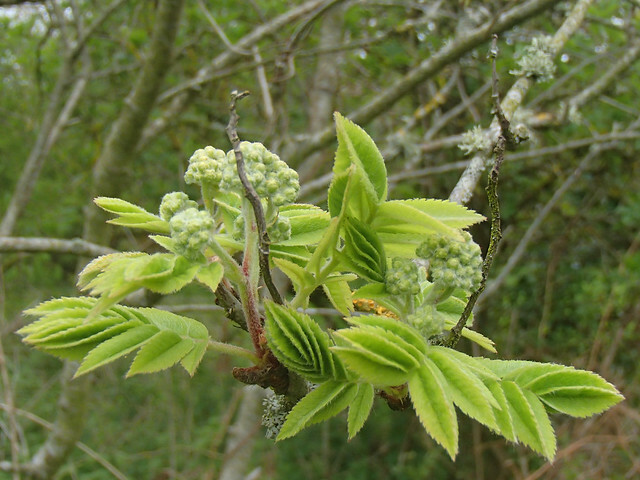 The river walk is dominated by alder, sycamore, blackthorn and hawthorn, with birches and rowans taking over on the other side, but up near the main road bridge is a whitebeam. 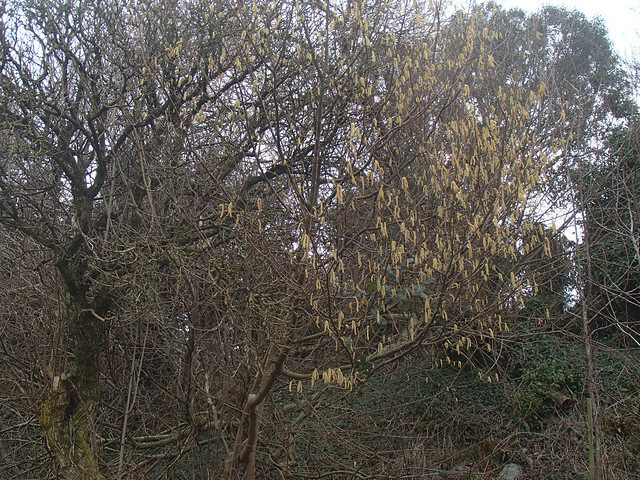 In early February it was a haze of yellow catkins, and I wasn’t sure what kind of tree it was. Now the distinctive leaves make id even for me a cinch. 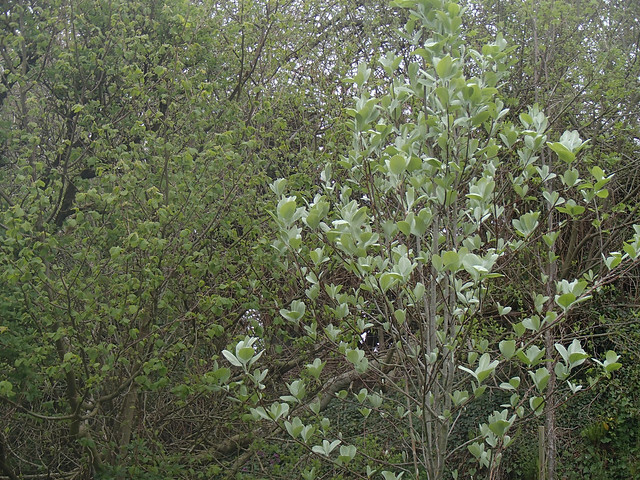 We drove through Snowdonia the other day and the roadside was decorated with loads of young whitebeam, the bright silvery leaves contrasting with the acid green new foliage of the birches. Our singleton is less dramatic but still very lovely. On the other side of the river there is a small copse of mostly birches with some more ornamental trees. If you squint, you can almost imagine yourself in a bluebell wood, except that you could easily count the birches without taking your socks off, and the bluebells are, sadly, Spannish, not native. The trip through Snowdonia I alluded to was to visit Kate, partly to see her and Karen’s lovely gardens, but the timing was to catch the bluebells in Kate’s local wood. 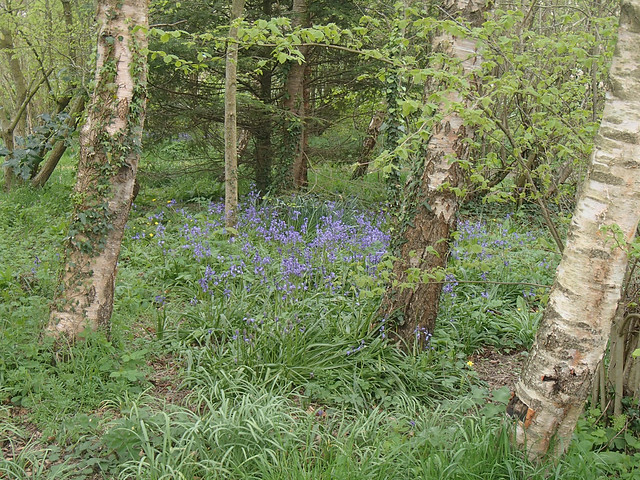 Now that was a bluebell wood! But back to my tree, in its little river valley. 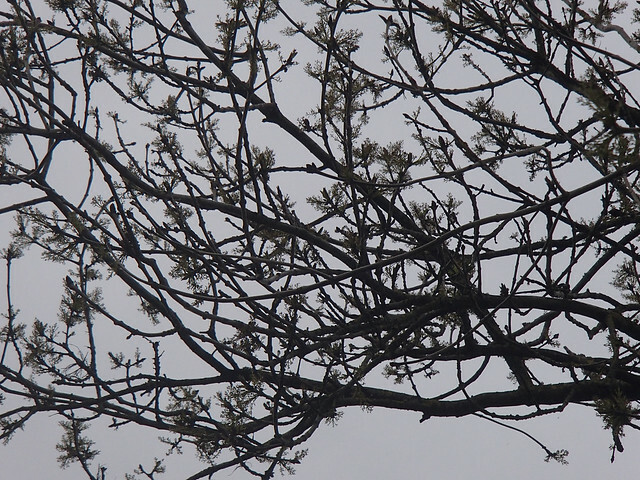 I have to admit to rambling, rather, I kept getting entranced by all the signs of Spring. 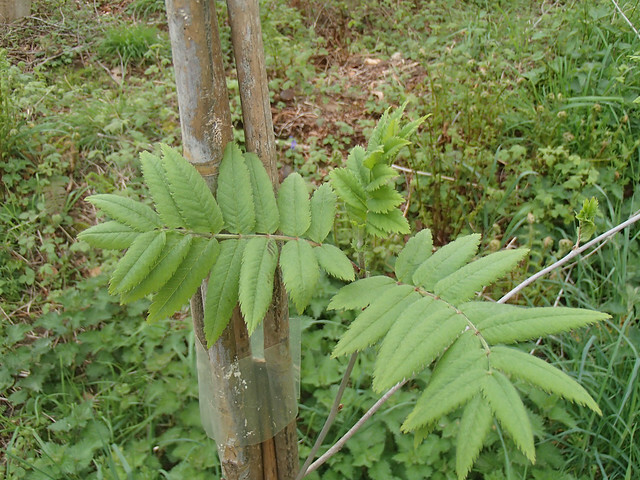 New rowan leaves unfurling, on a newly planted sapling, filling a gap created by storm damage, and on a more mature neighbor. They are one of my favourite trees, I love the pinnate foliage. There are houses that back on to this side of the river, and some have sections of garden that spill down the very steep slope. I always look forward to seeing the area around what I call the “allotment”, because there are always bulbs. Snowdrops are followed by narcissus and fritillaries, and now bluebells, mostly natives, though I am sure this won’t last as the Spannish bluebells hybridise with them and overwhelm their less vigorous stock. It takes a lot of commitment to tend a veg patch accessible only down such a vertiginous slope! 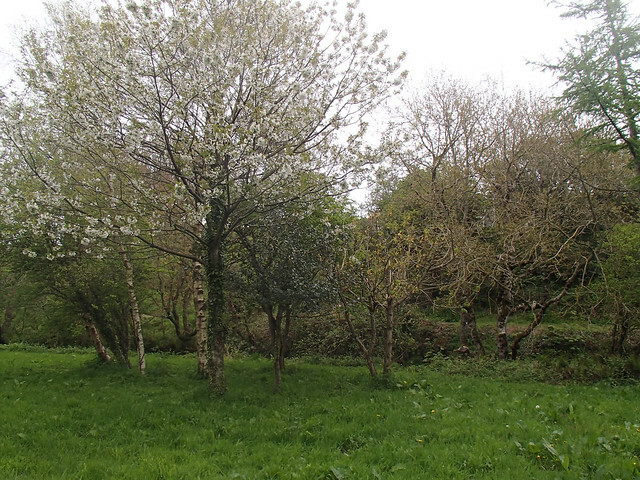 There is a cluster of wild cherries next, with beautiful white blossom. I do enjoy the pink forms, but the white is very lovely in this sort of setting. Just before I get to my trees again, there is a series of tidal ponds. These have been the subject of much debate in the village, as they were created with money from the lottery but augmented by the parish council. Some think them a total waste of money, particularly when there has been such a battle to keep the public toilets on the High Street open, but it does create another habitat, and the clearance work is evident here too, along with new plantings of marginals. I should do a post about these ponds one of these days. Though probably not this year! 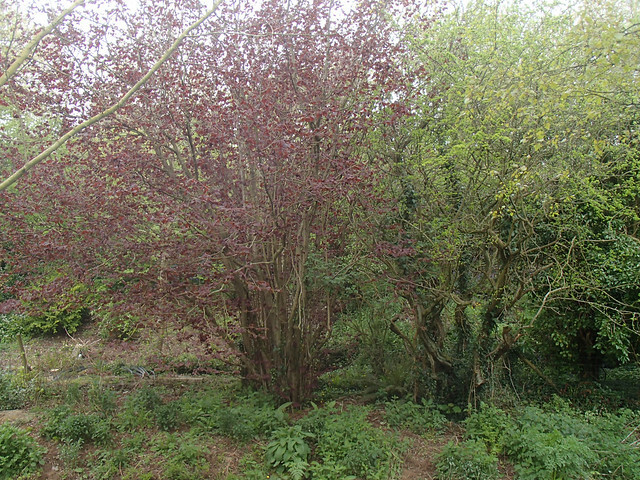 Anyway, here we are, at my stand of marker trees which tell me that I am opposite my own little cluster. 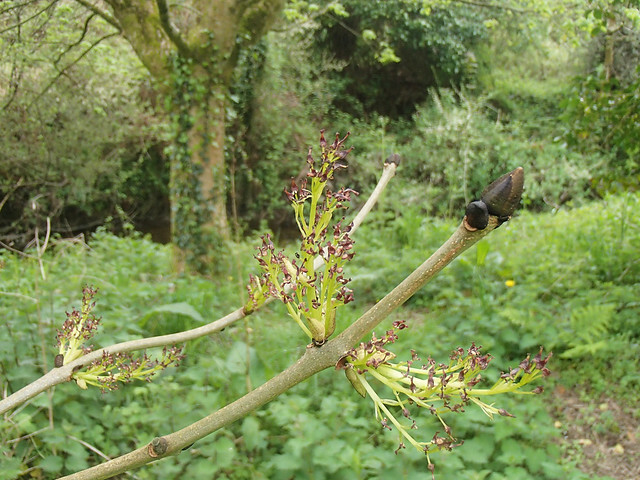 But no, finally, we have proof of ID – male flowers say definitely an alder! The excitement was too much for me. I headed to the steps leading up to the High Street, where the slope, very different to my route down to the river, is smothered in alkanet. 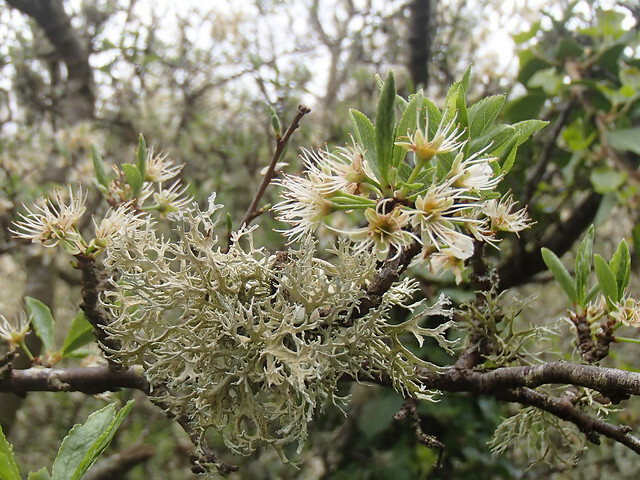 That might sound as if I know what I am talking about, but the truth is these posts take me so long to write because I am constantly having to look up trees and flowers, gradually increasing my knowledge of the native plants. Apparently the roots of alkanet can be used to make a red dye! 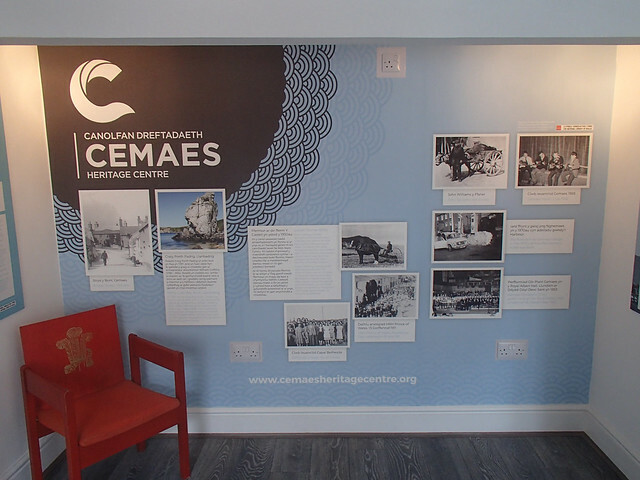 But I don’t linger, not today, because (drumroll pelase…) the Heritage Centre is finally open! Now there’s an incentive to contribute to Lucy’s Tree Following meme more regularly from now on! What a fascinating post. I did enjoy it. 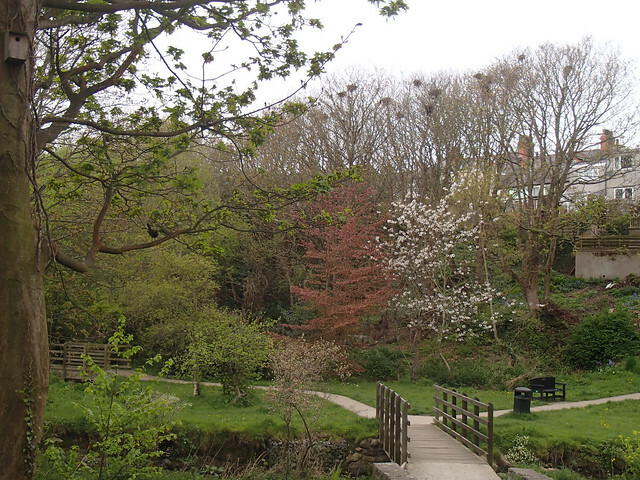 I love an amble through other bloggers’ beauty spots. It is wonderful scenery here with such lovely trees and wildflowers. 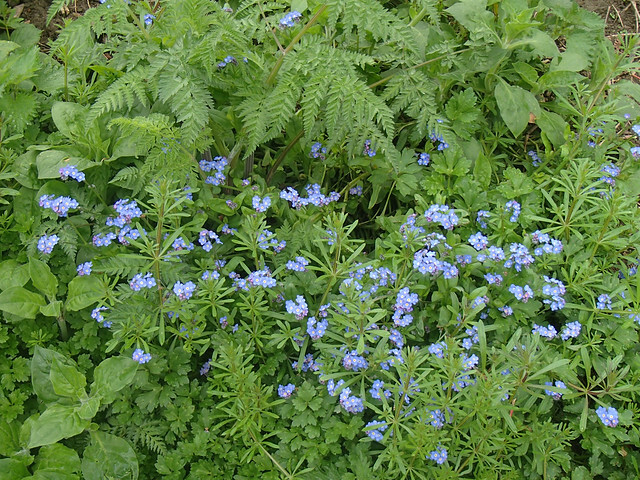 Blue Alkenet is a pretty wildflower but it is a dreadful weed in my garden, I just can’ t get rid of it. 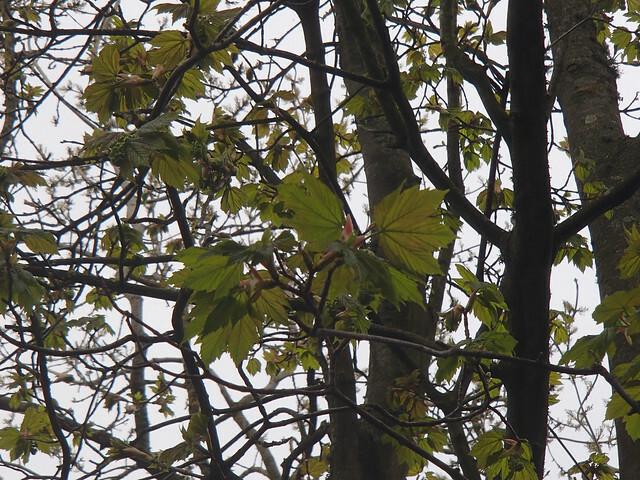 It is such fun to watch the trees from winter onwards and see them coming into leaf. There is a lovely mixture of trees to enjoy here. Thank you Cathy, I am not at all familiar with alder, so I am looking forward to getting to know this one. I suspect that, strictly speaking, I should add at least three miles along the cliffs to the walk to “deserve” the cake given the generosity of slice size, but hey, I look forward to trying their other cakes over the coming months. What a lovely post and update Janet :) thanks for taking us along for a wonderful and I quite fancy a cake now! Lovely shots and a great update – thank you! Some of that clearance has been a bit savage though, but I expect it will heal/grow up soon enough. 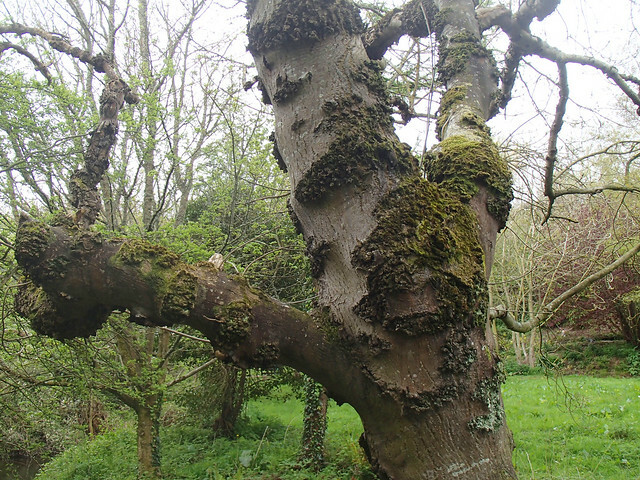 And congratulations on the alder – I do love alders. Look forward to seeing more of it. 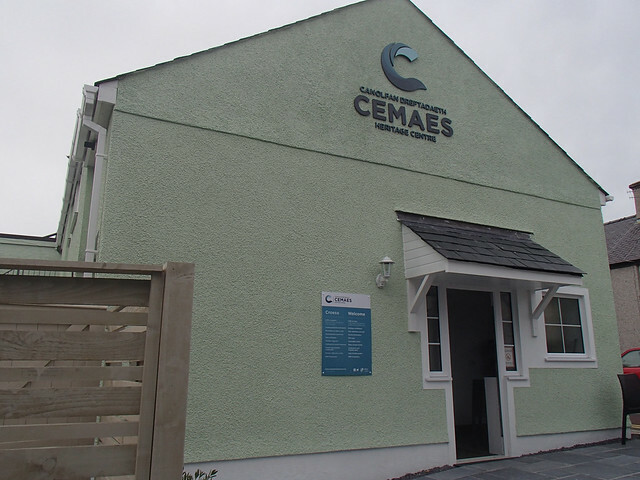 The Heritage Centre looks good (particularly the cake)! 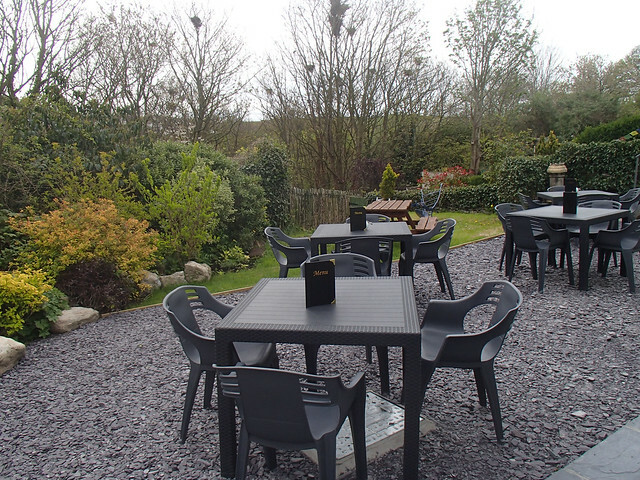 You’ll have to try the cake out for yourself when you visit! I anticipate being rather shocked at how quickly the clearance becomes a distant memory, and it is good to see the pond emerging from the undergrowth, but I do wish people didn’t attack ivy so visciously, particularly in such a natural setting. As to alders, I am utterly unfamiliar with them, but given how prolific they are around here it feels appropriate to get to know one. What a lovely walk along your river, I really enjoyed it all. I’m glad that you have now identified your tree, the wood is wonderful for carving! All the wild and not so wild, flowers in the wood look so nice, some look as though they have have come from the gardens nearby. I can see you coming more often for yur walk and cake! Hello Pauline, what is it that makes the wood so good for carving? Does it have a lovely grain? 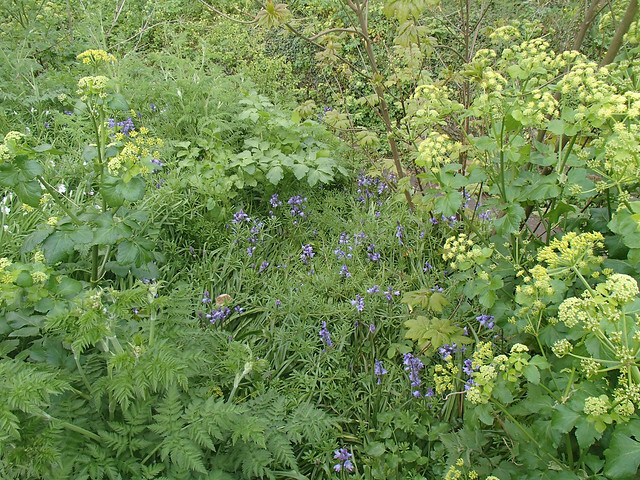 And yes, lots of garden escapees, but plenty of wild flowers too which is lovely. 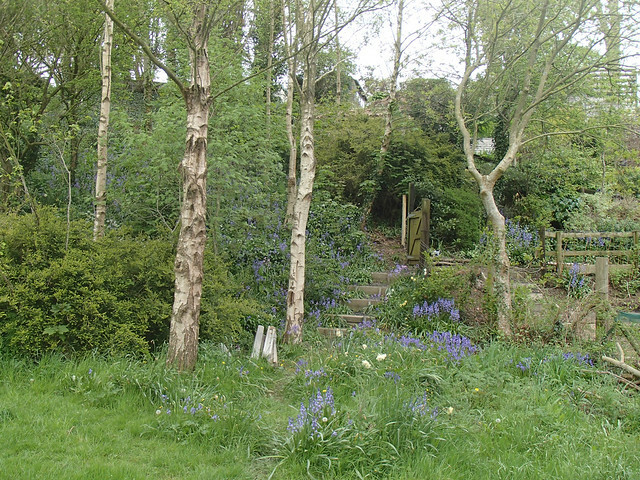 It is a shame about the bluebells though, they are planting more natives in the little community woodland but I fear they too will soon be over run. Terrific post Janet, and a bonus to get confirmation of your tree. Thank you Alistair, it felt good to finally be able to confirm the ID, isn’t the internet wonderful! Hi Frances, glad you enjoyed the river valley, it is a lovely place, loads of people walk their dogs there, but happily they seem to clear up the mess, unlike elsewhere in the village! 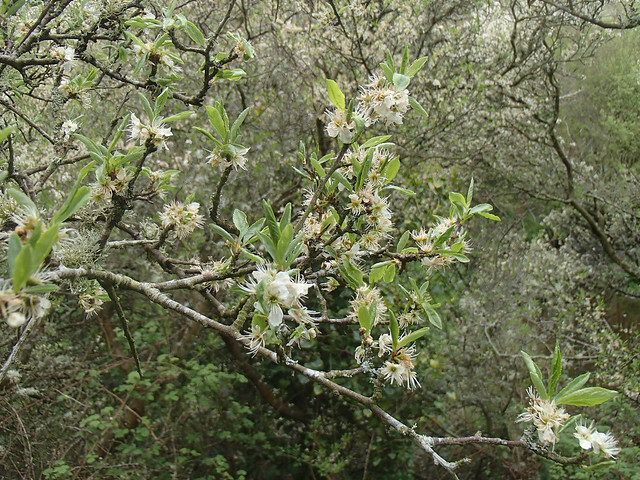 I can see you being on catkin watch next year – apparently you get both male and female flowers on the same tree (monoecious), but I didn’t spot any open catkins, just tight dark brown buds. The alkanet is in the same family as borage, and I agree, the leaves are very attractive. A thoroughly enjoyable read Janet. It was almost as if we were walking with you. 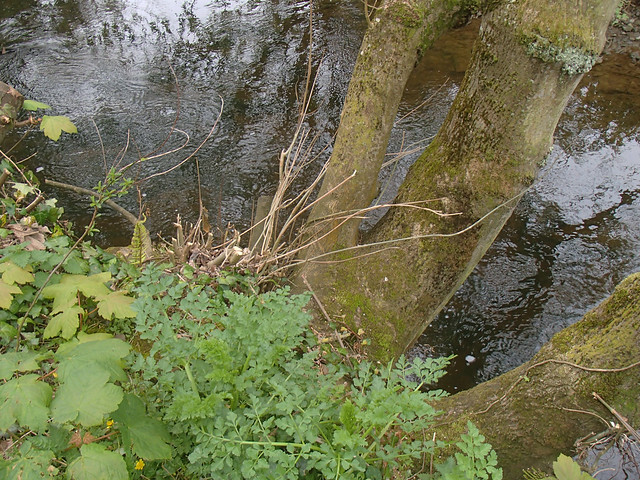 I am going to take a leaf from your book and perhaps concentrate on the section of river alongside my house for next year’s tree following post. Like you, it will educate me. 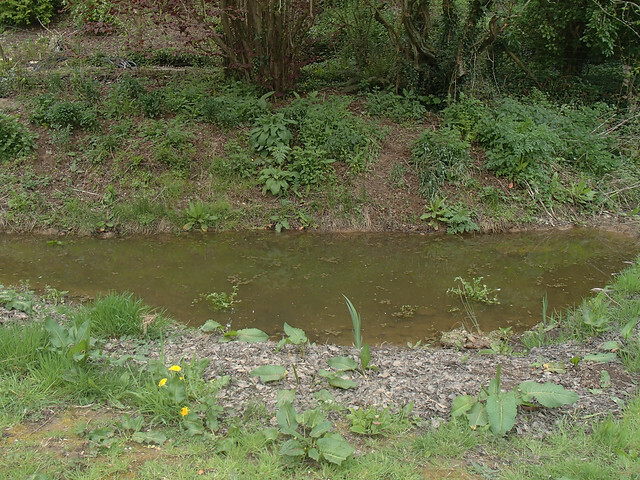 Our small section of river and surrounding banks have been designated a site for natural conservation but I do wish they would improve the pathways etc. Making it more accessible. 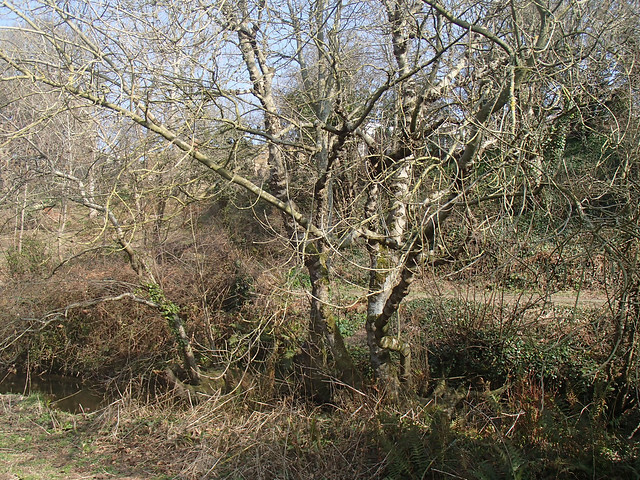 Sadly, our section of the River Almond is neglected by the powers that be and they concentrate on the sections of the river that are beside some of the extremely affluent areas here in Edinburgh. It’s not for the want of trying, the residents association lobbied many agencies for help, sadly, none was able to offer us assistance and because of this local interest has almost diminished. Thank you Angie, and I look forward to reading all about your river next year. 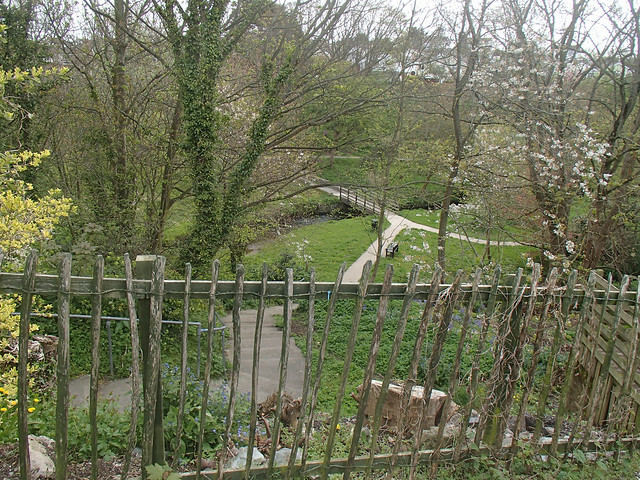 I think it is appalling that the poorer areas don’t get the same level of attention when it comes to fostering access to green spaces, particularly as there is plenty of research to suggest that access to beautiful wild areas can enhance well being and surely access to local amenities could help foster community spirit. 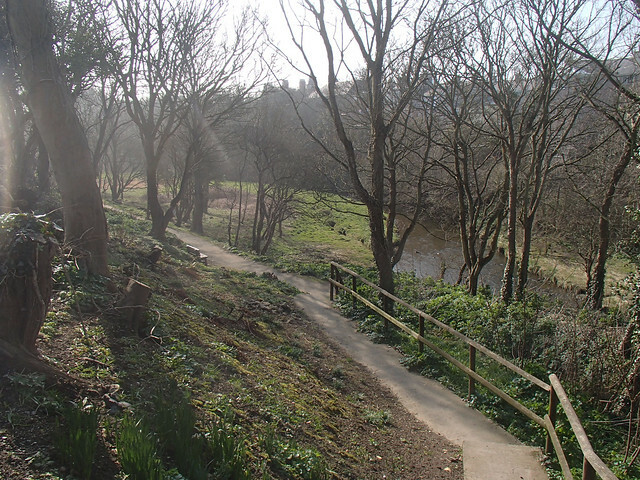 Besides, access to the environment should be available to all, though the steep sides to the valley make access to our little woodland area along the river impossible for wheelchairs and pushchairs. A wonderful post! I would like to take the stroll with you and then settle in with my own plate of cake and coffee. What a joy. Hello Susan, I’d like to share slice of cake with you too! A most enjoyable, and interesting, post with wonderful pictures. I have to say that veg patch is definitely gardening on the edge so to speak! Hello Flighty, thank you, and yes, I really don’t envy the gardener all those steps, particularly not after a few hours of vigorous gardening! Dear Janet, I truly enjoyed reading your post. That was a lot of work and I can imagine that it took you forever to write it. 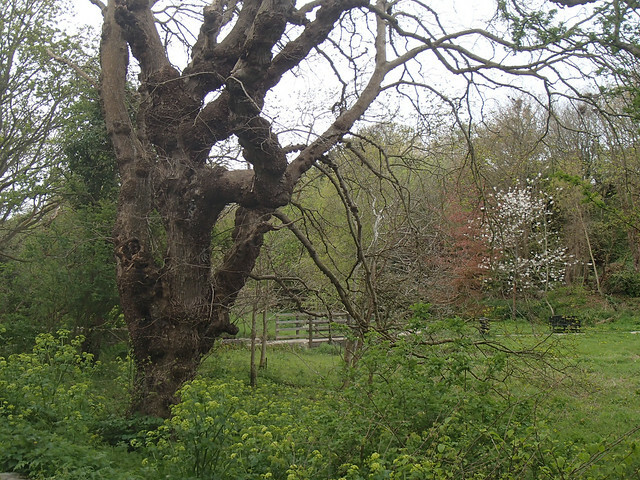 I loved the walk through the English woods, as they are so wonderful and special. 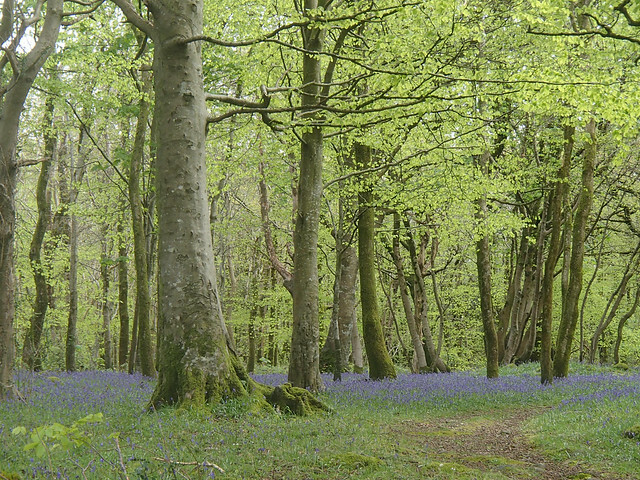 The photo with the majestic trees and the native bluebells is simply magical! I also really like the Alkanet, which is a “new to me” plant. I am always smitten with this hue of true blue, when it occurs in flowers. The Heritage Center looks great and how wonderful that it has its own little garden (the view down the river valley is so pretty) and that they are serving coffee and cake. I would be there every day if it would be close to me ;-)! Thanks for the awesome tour! Hi Christina, glad you enjoyed the virtual walk, I agree about true blue in the garden, though I need to learn to curtail the forget-me-nots, I love the cloud of blue they produce but they do tend to overwhelm the other plants. 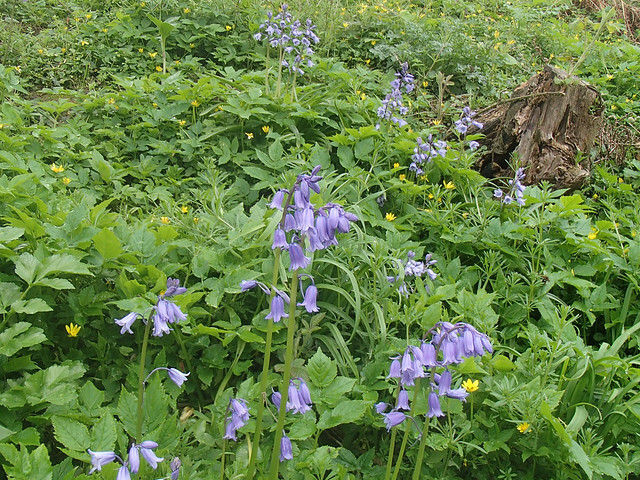 A bluebell wood is a rather magical sight, I count myself lucky to have wandered through one this year. I am enchanted by the river walk that takes you to your tree. The scenery is from a fairy tale. The view from the Heritage Centre is also wonderful, not to mention the cake! 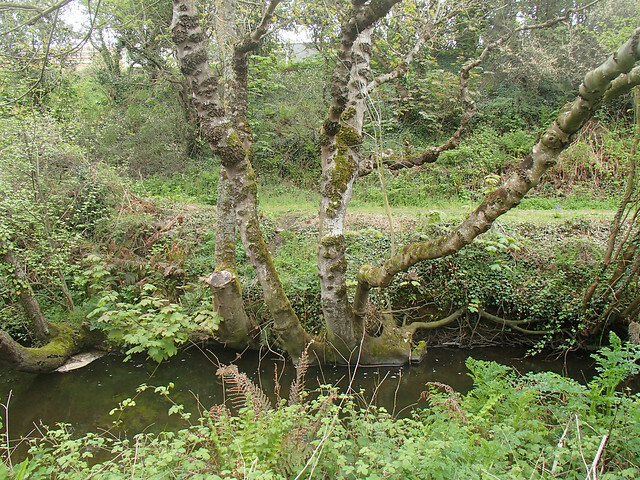 Thank you for choosing and posting about an interesting alder in a very special setting. Hi Deb, the river valley is a lovely mix of wild and managed, I like the fact that the new trees being planted are all natives, it would be tempting to plant more exotic cultivars,for a more dramatic look. I’m happy with my tree choice, it means I have spent more time along the valley this year than previously. 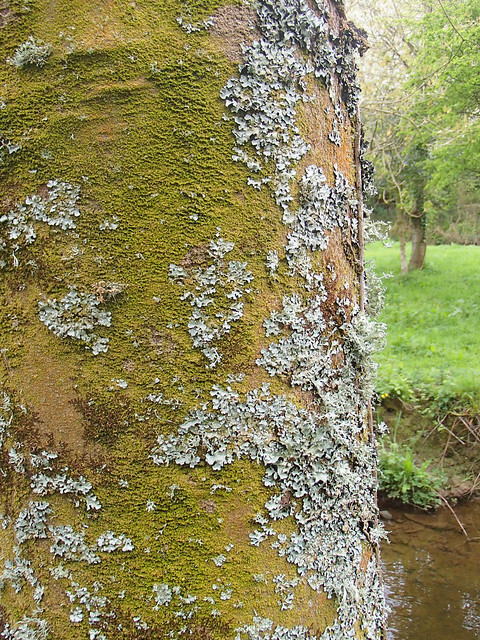 That was a most enjoyable walk along the river with two excellent outcomes- the tree identified and cake. Perfect. Alkanet is a beautiful thug, isn’t it? That vegetable garden looks even steeper than mine.. I feel for the owner! I know! 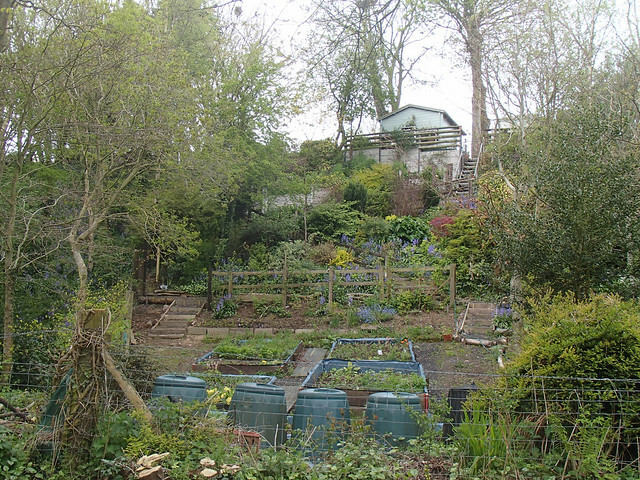 Positively vertiginous, though at least the veg patch itself is pretty flat. I just wrote a comment about your post when all of a sudden my internet pages shut themselves down and it was lost so I hope you’ll forgive me a truncated version and merely put what was a sort of p.s. The photograph in the article flatters it. It’s beside a roundabout on a busy junction so you can’t go down into the dip to see the water and the poles are high enough only to be marginally above sight-level from the road. The rocks themselves look like natural sponges that have grown old and mouldy. Why anyone would want to copy them in their gardens is beyond me – though last week I saw a heron fly up from the pond. Hi Lucy, that is a very strange sculpture, in that location in particular, though at least it was funded by the Arts Council. Some of the money for the ponds came from the same pot that had to fund keeping the looks open, hence the controversy. Our local sculpture is one of the Time and Tide bells (http://www.timeandtidebell.co.uk). It was supposed to be installed on our local beach but residents campaigned against it for fear it would keep them awake. Instead it was placed on the main beach, and I love it, but the only time you can hear it clearly is when people throw stones at it, so I wish it was on our local beach… Lovely idea though, and funded from elsewhere, so no cost issues. The standing joke is that well wake to find gypsies/Irish/Scousers have dismantled it for scrap, that kind of casual racism abounds here, sadly. 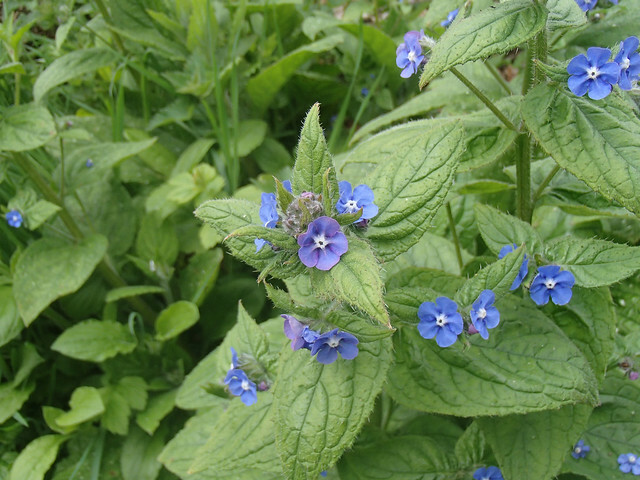 A beautiful area, That alkanet looks just like the omphalodes that we have in the garden, It’s a gorgeous blue. Hi Sue, it is a lovely blue, isn’t it, and the spotted leaves are attractive too, though apparently it is a thug. That is such a lovely, lovely place! 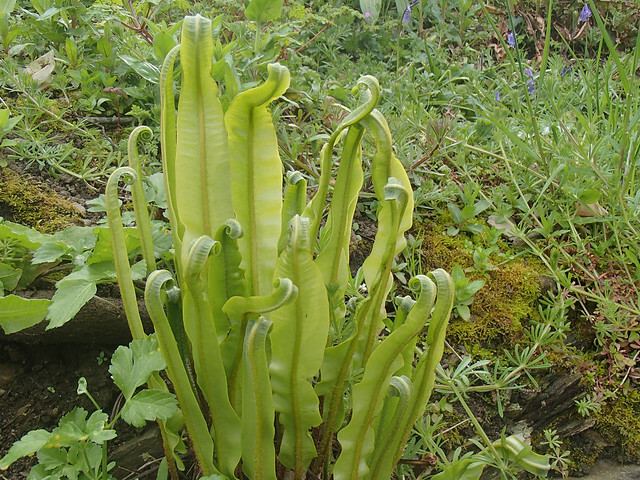 The Hearts Tongue Fern is a fascinating plant, and you captured it in an especially fun stage in its season. 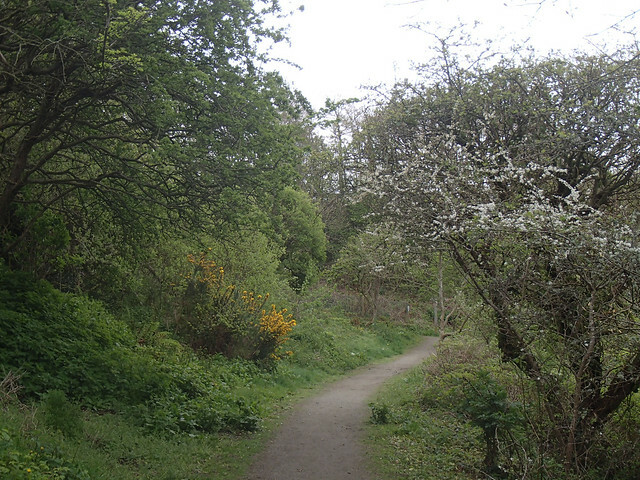 I really enjoyed all the winding paths, and wildflowers and trees along the way. Hello Beth, it is indeed a lovely place, and I agree about the Heart’s Tongue fern, there again, this is the best time of year for any fern, isn’t it! I am guilty too as my poor little fig tree has not been in the spotlight for months now. I always mean to, then miss the deadline for posting! I think your lovely new post has absolved you of all guilt though, as it is pleasingly fulsome !! 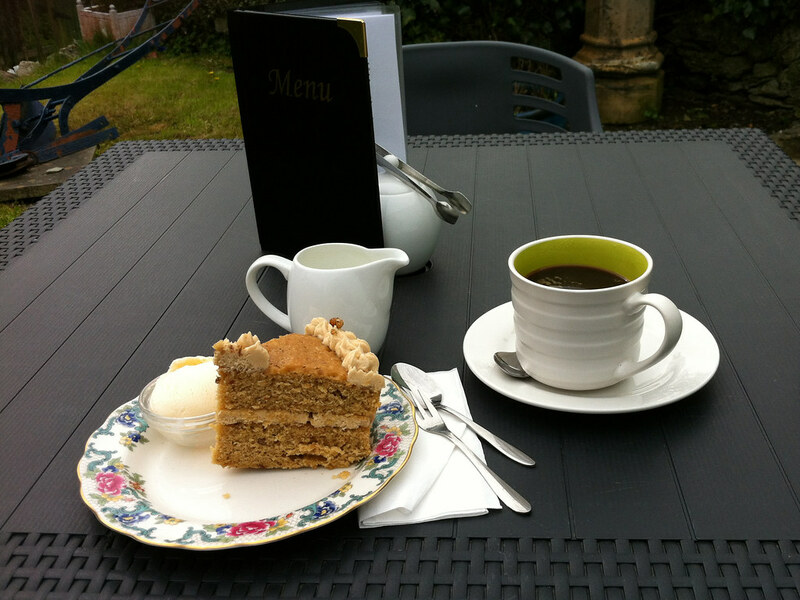 A lovely walk … made even better by cake !! What a lovely blog and so much to see and think about! I love the ferns particularly.